We are looking at ways to transport a tandem on our motorhome. In particular we are thinking of a towbar mounted carrier. Does anyone on this forum have any helpful suggestions or experience ? Roof mounted carriers are not an option. Yes! We cart our tandem about on the back of our motorhome using the standard Fiama bike rack but with a extra long tandem rail which you can get from Fiama. I also strengthened it up by using a spare solo bike rack rail and riveting them together. I then fixed a front fork block on one end and use the standard support arm brackets. I can either transport the front wheel in the garage or it goes on the spare solo bike rack. My wife made a cover for it. A picture says a thousand words so if you want any photos let me know! Unless you have a need for a trailer and/or have loads of spare payload, a towbar can add up to 50kg in weight so be aware of payload and rear axle loadings before you go down this route. We already have a towbar fitted so at the moment we have bought a 3 bike townar carrier and we are going to remove the carrier parts. We have a local metal fabricator who might make us a purpose built bar and support to be fixed to the frame. The front wheel when turned means the tandem fits inside the width of the van. This seems our best option at the moment. Hi I have a hymer and Fiama 3 bike rack on the back of the van. Manage to get my Cannondale tandem on the rack upside down with both wheels on. I take the pilot's saddle off and the Tandem fits between the bars (not in the bike slots). If you were stuck for lengnth you could take front wheel off. 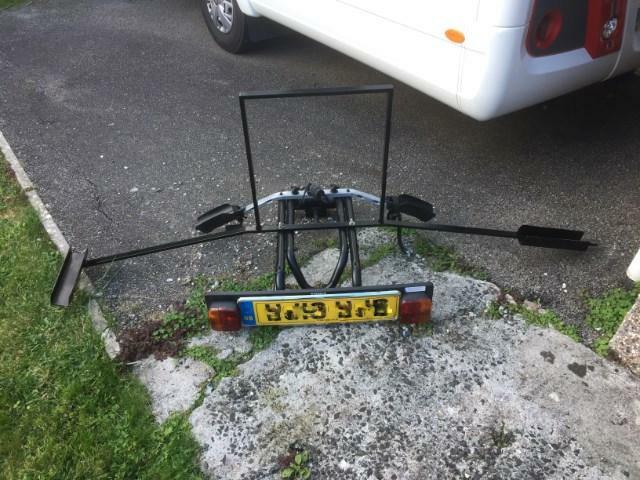 OK - We have solved the problem by adapting a three bike tow bar carrier.